Does it reset every time exactly at the end of the routine? And does it do it literally for all routines? I'm just wondering if it might have an issue with one of the balls in a particular routine. And did you try calling butterfly support? It's somewhat sporadic. I called one of the amicus engineers in the US, he gave me a few pointers, including adding a spacer to my table (i have the rollaway 22 match, so it's 22mm thick, added a 4mm spacer). Also ran the calibration routine and wheel spacing routine as well. What seems to happen is I'll set a program, changing parameters (spin, velocity, placement, trajectory, etc), and once i have it where I seem to want it, I play it for awhile. Then i'll turn the robot off when I'm done with it, and when I turn everything back on, the trajectory will either be into the net, or sporadically long past the edge of the table. Haven't called the engineer back since I did everything he suggested. Balls are Xushoafa 40mm 3 star poly. Ball 1 - long BH heavy backspin serve. Balls 3 - 6 -Medium to fast top spin balls to backhand, Midddle and 2 to the forehand. Whilst setting up the Balls i use Sample for placement of ball. Now If I try to start the Drill OR try and SAVE the Drill, robot Resets. This happens 99% of the time. Maybe once or twice the drill has actually started without a reset but I cant recall 100%. IF i try and recall a previously saved program there is no issue. 1. Memory 1-10 had been modified and should not have been! They have not confirmed as yet if they performed a FW update or how they programmed by Robot. I then responded back and asked why did you nor check the Reset problem and told them of the above issue. UK agent has now told me that Butterfly have now checked a drill can be set, saved and recalled and there is NO reset. Maybe a FW update or something has cured the problem or they are using different cables etc etc. just to clarify when I did try a previously saved program I cant recall which one worked at the moment so unsure if it had a lot of spin or high speed. I have the Amicus Advance Robot and its about 12 months old. I have the never version which has the 22 memory save setting. Recently the robot resets whenever I set up a routine (upto 6 balls) and start the sequence or if I try and save the routine. Either way the robot just resets. It is very annoying as I can only do a 1 ball routine. I read somewhere in the forum that it could be down to a short/static. I can recall a saved drill however this only works for a while. Seems other people have also observed this issue but unsure how to resolve it and why this issue occurs. Check and make sure cables are firmly plugged in. The one at the remote is friction fit only and gravity loosens it. Finally after some thought and research (actually read all 20 pages in this forum and more other threads), I went ahead and pulled the trigger on the Amicus Professional The BF deal helped as well, it was a hard sell with my wife but I was able to get her to agree with the purchase! Mine should arrive on Dec 5th. Looking forward to your expertise if I run into any issues and concerns. Can't wait and excited to get it! I just tried my Amicus pro now with my 1 star CLEAN Gambler balls like the forum recommended. It was a seachange compared to having tried it a few times with the balls directly out of the factory. All of that dust really did make a huge difference. Now, I can do all of the drills that were laid out on the butterfly pro presets with minor modifications. I am totally stoked. One full hard-core hour of multiple drills while listening to REM on my stereo in the background… Doesn't get much better than that.!!! Thanks Forum you folks rock... for what it's worth even though the gamblers are an improvement it's still not perfect and I suspect you're right, the gambler one stars are not perfectly round (but close!) and I will upgrade to butterfly 2 stars as my next purchase for training balls. I got Joola Magic to go with my Amicus. The balls will be arriving tomorrow but Amicus 3 days later, I'll definitely go and wash the balls in the mean time then. Thanks for the heads-up. Let me know how those Joola Magics work out... heard butterfly 2 stars are good Jooola 2 stars in 40 celluloid I had were great... since I am just getting back into TT after a 3.5 year hiatus (birth of son) would love to know how those Joolas work out. You might try modifying the settings of these multi balls or even single ball sequences as a test. I don't remember the details but when I first got the robot, it sometimes exhibits random odd behaviors, especially with settings that put higher demands on the power supply. I decided that the 28V/2.8A power supply that came with the robot is not beefy enough. Tolerance variations and random high current demand spikes can lead to glitches that affect the robot functions. I replaced it with a 28V/6A power supply with a metal housing and air vents. Make sure the new power supply has the right voltage and the right connector. Haven't had any problems since. I was expecting the balls (Joola Magics) arriving last week before the weekend and my Amicus Pro this week. Turned out Amicus arrived earlier but UPS messed up the delivery of the balls. What am I supposed to do over the weekend?! Good thing there is Amazon same day delivery, bought me some $10 50 pcs table tennis balls . I had family come over the weekend for some get-together and was worried to set it up and not make it work (after reading the earlier nightmare posts and reviews) and look like an epic failure in front of our guests . However, I was surprised at how easy it was to set-up, granted the manual was horrible! I did read the manual thoroughly and was able to manage to understand what they're writing. I have a 19mm table and found out that the Amicus, when mounted on the table, is tilting a little bit upwards. I found a small eraser (used to clean off rubber marks on the table, kids hitting the paddle on it lol) and wedged it under the table and voila! Amicus is standing perfectly upright. Ran the calibration and was off and running. My 9yo son, my nephews had a great time! I Just set-up simple 1 ball on the forehand and 1 ball on the backhand, normal settings sometimes add +1 or +2 for topspin and at times no spin balls, set to 40 - 60 balls per minute. Had one kid on left side and one kid on the right, that way everyone can play and not wait too long. I thought them basic forehand counter hit strokes and they were having a blast! The Amicus was the star of the day. 2) There are balls about 4 or 5 of them that really want to stay and get stuck by the PC connector by the ball recycling. 4) Liked the rNd function so balls don't drop at the same spot on the table all the time. 5) Tried the pre-programmed drills, balls were landing on the table and was able to manage the drills, eventually. Maybe Butterfly has already ironed out the kinks? 6) Also, tried to program a rally with serve, different balls and spins, (6 balls at the moment) and it's working out great so far, even after I turn off and on the system. I definitely will be playing more and make full use of this feature. 7) I've parked my cars on my driveway with the Amicus occupying the whole garage. 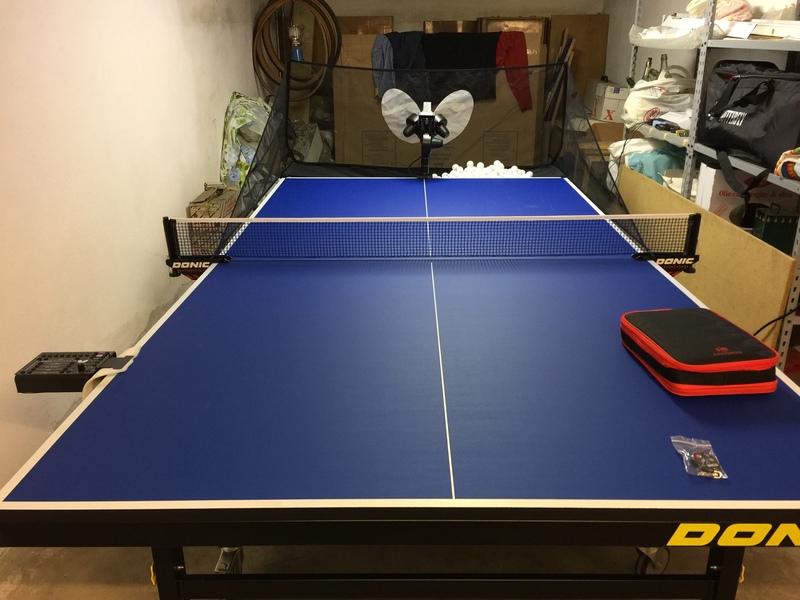 I like it when I get home and the garage door opens up, I see the Amicus and my TT table slowly show-up waiting and inviting me for some table tennis action. Welcome in the Amicus World mate!! New owner here. Got the pro a few days ago. Put a few hours on with no problems. Suddenly tonight I started getting loud vibration noise from one of the wheel housings when using significant topspin and/or a moderately fast throw. It's the wheel on the right as you look at machine from the back (left as you hit toward the machine). If I push slightly on the housing the vibration stops; this is how I know where it's coming from. Any thoughts?? On further inspection: the corner edge of housing is vibrating against the center column. A small piece of sticky felt would probably work. Or can I adjust position of the wheel? It's throwing pretty well so I'd be a little nervous I'd mess it up.